Our club is comprised of up to 85 members, some of which volunteer their time to serve as club directors. The club directors serve to provide responsible fiscal management of club funds, scheduling oversight, handle all aircraft maintenance, coordinate membership duties as well as provide general management of the club. We are guided by the NRI Flying Club by-laws which essentially act as our "constitution". In general we expect all members to act in good faith for the best interests of the club. Elections to the board of directors are held annually. Members enjoy good aircraft availability and the lowest possible price for a well maintained, well equipped and airworthy aircraft. 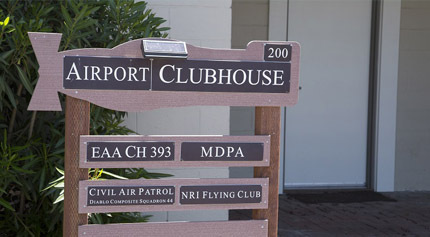 As a non profit and volunteer based club, all revenue from flight operations goes back into the club. Our stated goal is to break even, so basically it's not possible to operate an airworthy aircraft for less money. Members also enjoy easy access and flexible scheduling rules so they can most benefit from everything general aviation has to offer. We believe it is our duty and obligation to act in good faith as stewards of the general aviation community. Don't break anything, don't do anything stupid. Be courteous to the other members. Flights to Mexico currently require board approval. Special insurance requirements apply.